This is a marvelously fascinating book documenting the history of Eranos, a yearly, interdisciplinary meeting in Ascona, Switzerland that started in 1933 and continues on in different forms to the present day. Hakl’s book is balanced, while sympathetic to the underlying spirit of Eranos. It is very well-referenced, with almost one hundred pages of 8 point font notes. Eranos was the life work of Olga Fröbe, who brought together an interdisciplinary group of speakers for an exploration of the spirit in history, philosophy, psychology, science and mythology. These speakers included: Carl Jung, Joseph Campbell, James Hillman, Henry Corbin, Mircea Eliade, D. T. Suzuki, Martin Buber, Paul Tillich, Heinrich Zimmer, and innumerable others. Hakl’s work is detailed and exhaustive as well as broadly connected to larger societal themes. While the topic is very different, it is worth comparing it to Lipstick Traces: A Secret History of the Twentieth Century, by Greil Marcus. 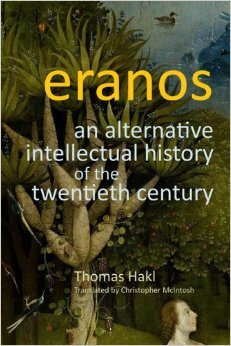 After an in-depth exploration of the people who participated in Eranos as well as the controversies surrounding the meetings and the individual lecturers’ lives and works, Hakl gives an interesting summary of subsequent organizations that sought to combine the scholarly and the spiritual, perhaps using Eranos as a prototype. Most notably, for an American audience, Hakl cites a discussion he had with Michael Murphy discussing the role that Eranos played as an inspiration for Esalen, in California, which has played such an important role in the human potential movement and fostering personal growth. As well as a history of a specific place and organization and specific historical individuals, Hakl also explores broader tensions between science, spirituality, objectivity, subjectivity, modernism, esotericism, individual and the collective. Hakl discusses the tensions between the rational/scientific world view and the esoteric/spiritual world view. His argument is that Eranos was a third view point which sought to integrate both science and inner spiritual experience. Here are a couple quotes that Hakl cites regarding the goal of Eranos as seeking a “rationality that does not reduce or fragment what it sees, but which enriches, synthesizes, and evokes responses,” (Charles Scott, 258). Eranos’ aim was “indeed to bring about more than an understanding but rather a knowing through direct experience,” (Ira Progoff, 258-9). And lastly, Henry Corbin, “we in Eranos never had the intention of adapting ourselves to some given model, we never paid heed to any orthodoxy, and we were concerned with only one thing, namely to press on into the innermost part of ourselves, pursuing that truth until we reach its farthest limits, (261). In summary, “Eranos was thus not exclusively concerned with learned scholarship but equally (although not in the case of all participants) with the spiritual transformation of humanity,” (Hakl, 11). I highly recommend this book for those who are interested in the “spiritual transformation of humanity,” as well in the history of this organization that brought together such influential thinkers as Carl Jung, James Hillman, Joseph Campbell, Mircea Eliade and Henry Corbin. The book offers glimpses into the lives of these different figures who lectured at Eranos, where they could try out new ideas and find a source for inspiration and companionship in a place whose goal was the synergistic integration of inner and outer knowing. This entry was posted in Being Fully Human, Being in the World, Creating Human Culture, Re-humanizing Medicine and tagged Book Review, Eranos. Bookmark the permalink.